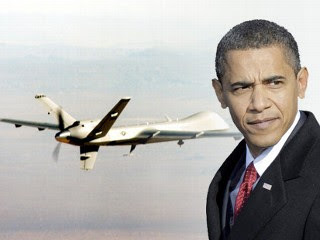 A Pakistani Citizen From Tribal Areas named Abdul Karim Khan has announced to Sue American President Barack Obama and officials of American Intelligence Agency CIA for Killing his young son and brother in a drone strike in North Waziristan Tribal Area of Pakistan. Son and Brother of Abdul Karim where killed in 2009 in a illegal drone strike by CIA and now he has planned to do case against the officials of CIA. Abdul Karim done a Press Conference in Pakistan's Capital Islamabad on Monday in which he said that American drone attack killed my young son, brother and a local citizen and non of these people where terrorists but common citizens of Pakistan. He said we want justice for our innocent people that are killed in these drone attacks. Abdul Karim's Lawyer Mirza Shehzad said that we will go to International Court of Justice against illegal American Drone attacks. Thousands of innocent Pakistani Citizens are killed in American drone attacks in last two years while US Media tries to show that these attacks are killing only terrorists. These drone attacks are not only causing terrorism in Pakistan but also increasing hatred against US in hearts of Pakistanis. How to Earn Money Online by Blogging in Pakistan?